It remains to be seen whether the Lamex Stadium witnessed the coming of age or more baby steps before crumbling to the floor. Nonetheless, Adam Webster’s magnificent display at the heart of Pompey’s display rightfully earned him plenty of praise from those present. Recalled to his favoured position in Gary Waddock’s maiden fixture as caretaker boss, the 20-year-old responded superbly. 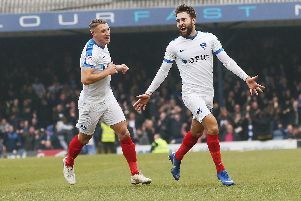 Pompey may have suffered a 1-0 defeat at Stevenage, yet the brightest of performances was provided by a player so often out-of-favour for large periods of a disappointing team campaign. Webster’s 10th start of the season was only a second at centre-half. And Waddock was full of praise for the home-grown product. He said: ‘I thought Adam Webster was outstanding. ‘For a young lad to come into the side in difficult circumstances, against a very good team who do put you under pressure and on the back foot, he dealt with everything very, very well. ‘I was delighted with him. ‘Adam has wanted to play more often. On that showing against Stevenage, you wish he had performed consistently like that throughout the season when he had his opportunity. ‘But in fairness to him he has played at right-back a lot of the time and found that difficult. ‘He is a centre-half and, as we saw the other night, can perform there. I think that is his best position. ‘What he gives you is composure, on top of that against Stevenage he dealt with the physical side of things, was able to get his headers in when he needed to and was very, very strong when put under pressure. The West Wittering youngster, who has made 43 appearances for the Blues, was back in the side following concussion to Josh Passley. Passley’s right-back absence saw Joe Devera move across, allowing Webster to line up alongside Nyron Nosworthy in the centre of defence. There was also a recall for veteran Nicky Shorey after 16 matches away from the side, with Jed Wallace injured and Wes Fogden moved to the bench. Waddock added: ‘Injuries played a part in the Stevenage team selection, of course they did. ‘There were players not involved recently who have shown a fantastic attitude on the training ground and come back into it. ‘They have an opportunity now because we have quite a lot of injuries. ‘The remaining fixtures will change in terms of team selection and I have already told the players that, so it won’t be a surprise. ‘Sometimes you need to freshen it up, you need to give people opportunities and that is what I am going to do.